The Penguin Project was conceived by Dr. Andrew Morgan to give children with disabilities an opportunity to participate in the performing arts. “Dr. Andy” is a developmental pediatrician and the Chief of the Section of Child Development at the University of Illinois in Peoria. He is the primary medical specialist in Central Illinois involved in the diagnosis and treatment of children with disabilities, but has also directed and performed in many community theater productions in the area. He created The Penguin Project recognizing that theater not only provides children with a valuable recreational experience and an opportunity to display their creative talents, but also enhances social interaction, communication skills, assertiveness and self-esteem. 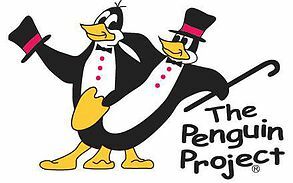 The Penguin Project strives to demonstrate that individuals with disabilities are fully capable of participating in community activities with the same dedication and enthusiasm as others, if given opportunity and support. The Bloomington-Normal program was the first replication site for "The Penguin Project" - a program that originated in Peoria and went "on the road" to other communities. Our program was founded in 2009 and has been getting stronger every year. Productions are staged in June of each year. So why Penguins? The origin of the name “Penguin Project” comes from the unique characteristics of penguins. They are extremely playful and curious, and they work and play together. More importantly, they have a “disability” that distinguishes them from other birds - they can’t fly! Instead, penguins waddle and toboggan on their bellies over the snow, and are excellent swimmers. Like the participants in the program, they have adapted to the challenges of their environment and have not allowed their unique difference to interfere with their lives. If you would like to make an online donation to the Penguin Project Fund, please click on the Donate button below. If you prefer to make a donation in another manner, click here for information.